As 2016 natural catastrophe headlines funnel in from various media outlets and insurance publications, a theme of negative highlights quickly emerges. Few headlines point out the positives that occurred. In this post, I want to highlight a few of the 2016 insurance industry positives that might otherwise be lost in the sea of negative news as it relates to natural catastrophes. When the calendar flipped to 2017, a switch seemed to turned on for US severe weather season: severe weather impacted the Gulf Coast states with 31 tornadoes on January 2 (PCS 1711). Just two weeks into the year, 2017 already has 4.4 times more than the normal number of tornadoes. However, the great news is that 2016 ended with lower reported tornado numbers, and the preliminary numbers suggest that 2016 ended up as a year with the fewest tornadoes since 1954 (when records started). NOAA plot of the annual running total of tornado reports compared to inflation adjusted values. 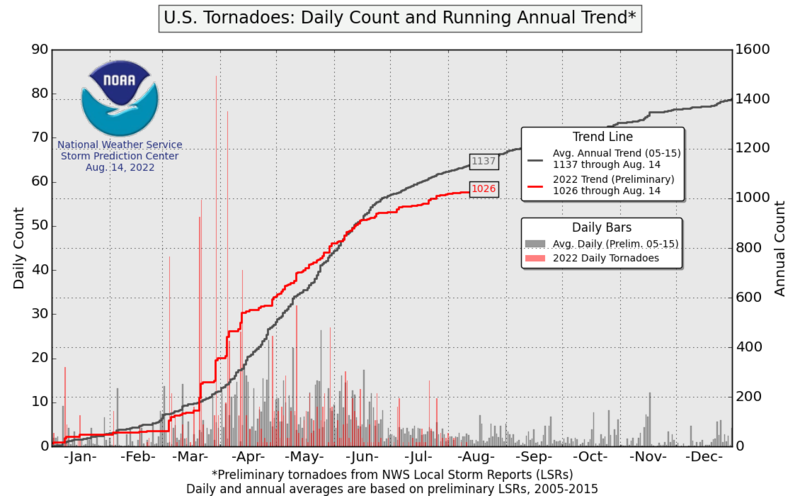 This might not seem remarkable given the US has experienced five years a row of below near term normal tornado reports (2005 – present year) since the near record high year of 2011. So the good news is the US continues to see lower tornado counts for several years in a row now and is currently in what some scientist call a “tornado drought.” The other good news is that, as a matter of luck, the tornadoes that did occur did not result in large insured loss events. There were many close calls like this major tornado that occurred just 3 miles south of Dodge City, Kansas. Various reports point out that 2016 produced the highest severe weather-related losses since 2011, but along with the lower tornado count, 2016 also produced hail reports below the 11-year average. As a matter of a different kind of luck however, these hail events targeted several populated regions across the state of Texas which produced most of the 2016 severe weather-related loss. The overall good news is that hail events across the other states were at or below average. It is easy to highlight devastating 2016 U.S. flood events, but given the current flood take-up rates, these events were mostly uninsured. But the good news is the federal government and uninsured homeowners and business are taking steps to protect themselves from future flood events. And there’s more positive 2016 flood news: Since 1965, 60% of U.S. measured locations have seen a decrease in flood magnitudes according to the newest EPA study. Finally, no significant trend in major flood events seems to be emerging when looking at historical major flood events as defined by FEMA. On average, 87 named tropical storms occur worldwide in any given year. 2016 saw 79 tropical storms, and just 42 were hurricanes (which is again below the average of 48). It should also be noted that so far for the 2016/2017 Southern Hemisphere named storm season (starts July 1), only 2 named storms and 0 hurricanes have formed to date (an average of eight named storms and four hurricanes occur at this point in the season), which equates one of the slowest starts to that basin in history. However, what the insurance industry cares most about is landfalls, and in 2016 global landfalls were spot-on average: 14 hurricane-force storms made landfall, and five of them were major. Two of those 14 hurricane-force storms impacted the U.S. coastline: Hermine and Matthew both produced isolated impacts that could have resulted in much worse impacts for the insurance industry (considering that one cat modelling company estimates the average annual loss for U.S. hurricane is $15B). The modelling company’s average annual loss number might seem high due to the lucky streak the US has experienced in recent decades: a continued record period without a major hurricane making US landfall. Undoubtedly there will always be major catastrophes in any given year, and the media will focus on these events. Undoubtedly some insurance and reinsurance companies suffered in 2016. But all in all, 2016 was a great year and could have been much worse for many more organizations within the insurance industry if the trends mentioned above were reversed. 2017 could likely change the trend of these natural perils which is why it’s best to understand exposures to all natural catastrophes. With celebrity death and elections taking the media by the nose, it’s easy to forget that this year saw a great many positives. Let’s look. Now that Matthew’s story is complete, immediate attention will turn to Nicole, a tropical storm currently 450 miles south of Bermuda. The models generally agree that Nicole will slowly strengthen back into a hurricane and that there is a good chance that Matthew will become a strong category 1 or weak category 2 hurricane as it tracks close to Bermuda this Thursday. So with no tropical troubles threatening the U.S. coastline in the immediate future, this is the time of year that the insurance industry often wonders if there is any other tropical trouble forecasted for the remainder of the year. Climatologically over the next two weeks we tend to see stable named storm activity, but after October 18th, the activity in the Atlantic Basin drastically trails off. This is also roughly the time of year that the West African – Cape Verde type hurricane season trails off due to the equator-ward shift of the African Monsoon. This past weekend the overall tropical rainfall seemed to shift below 10 degrees north latitude, which is the benchmark for tropical waves coming off Africa to obtain enough spin to become named storms. Here is a look at the tropical rainfall totals since mid July. It shows the height of the African Waves during middle of August with a trailing off over since this period. The axis to the left is latitude showing a trend towards the equator. This is also the time of year that colder Canadian troughs of low pressure air start to invade the U.S. Often these weather systems leave trailing cold fronts that sometimes extend into the southern Gulf of Mexico or Caribbean. Low pressure can form at the tail end of these fronts, and if the water is warm enough in the Gulf or Caribbean, it can encourage tropical convection which could then become organized. These typical developments are consistent with some of the models’ long-range weather forecasts for later next week. Forecasts for Thursday morning show an area of low pressure moving across the upper Great Lakes, which could provide the first freeze of the year for the upper Midwest. This forecast also shows Nicole moving toward Bermuda. This low pressure moves across the north Atlantic late next week, and it leaves a trailing cold front with an area of low pressure off the east coast of Mexico in the western Caribbean. This is the area that needs to be watched for tropical trouble later next week as the water in this area is plenty warm enough to support tropical convection. The long range forecast from Oct 17 – Oct 24th total precipitation plot below show a decent amount of rain which could be from convection thunderstorms. The graphic below illustrates the climatological pattern that is typical of tropical storms that originate in October so the Western Caribbean is the place to watch over the next three week. Matthew is now classified as a post tropical storm as the majority of its energy has merged with a mid-latitude frontal system. As a result Matthew will once again defy the long range forecast models that had suggested Matthew’s energy would travel southward towards the Bahamas. Now Matthew will go out to sea just like the majority of tropical systems and Matthew’s long story will end. Almost a complete 180 degree change in the direction Matthew is expected to take in today’s 8 AM NHC official forecast. Now Matthew is expected to track north of Bermuda. However, the damage is done and it is becoming apparent that water related damages could add up to more than the wind related damages. In fact’ the water damages will continue to add up as many major rivers in Carolinas are expected to hit record flood levels. In some cases there have been dam breaks which is reminiscent of the incredible rain event just over a year ago from tropical moisture from Hurricane Joaquin. So with major rivers still rising, the flood situation is still unfolding, particularly in North Carolina which will lead to more losses in the next few days. However, it is assumed the majority of the inland flooding / river/ storm surge losses are either uninsured or are being assigned to flood policies by the NFIP. As shown yesterday, the National Flood Insurance Program take-up rate by counties which are heavily coastal in nature across northern Florida through the Carolinas decreases for inland counties. Therefore the majority of insured losses should be driven by wind related claims. Past 7 Days of Rainfall observed. It should be noted BMS iVision also has a rainfall layer users can use to understand risk impacts to flooding. As highlighted in yesterday’s update storm surge has also done a lot of damage along the entire coast from Flroida up to North Carolina. Wilmington, NC 8.21 feet: Previous record of 8.15 feet during Hurricane Hazel in October 1954. Notice in the image above however that one of the areas hardest hit by winds in Florida right along the coastline. Most of the homes are relatively undamaged from this view. Other damage from University Florida Damage Assessment group find minor roof and exterior damage along parts of the Florida coastline with surge leading to most of the damage observed. As pointed out several days ago, treefall would be enhanced due to the saturated soil conditions in the Carolinas. With this combined with wind gusts and the lack of any significant large scale wind event over the region in several years, wind related tree damage could increase insured losses. Since wind related damages will likely drive the insured loss, users of BMS iVision can now get a full picture of Matthew’s wind swath by looking at the 1 minute wind speed and 3 sec gust wind speed. In the coming days users will find wind duration information. The only public report of insurance industry loss numbers was in a report issued Saturday afternoon by, CoreLogic, which estimates Matthew’s insured losses to range between $4B to $8B with 90% of loss being driven by wind claims, 10% by storm surge. These estimates are well below the industry loss estimates projected by the major catastrophe modeling firms late last week. However, they are somewhat inline with the other industry loss numbers from other modeling firms (not yet released publicly). While Matthew was within 20 miles of bringing much larger insured property losses, Phil Klotzbach of Colorado State has compiled the historic statistics on Hurricane Matthew. 80 mph intensification in 24 hours – the 3rd strongest rapid intensification in the Atlantic on record (trailing Wilma-2005 & Felix-2007). 6th lowest MSLP for any Atlantic October on record at 934 mb (trailing Joan, Opal, Mitch, Wilma & Joaquin). Consistent MLSP records date back to 1979. Longest-lived Category 4-5 hurricane in the eastern Caribbean (<=20°N, 90- 60°W) on record. Note: While Atlantic hurricane records go back to 1851, there are likely underestimates in storm intensity prior to the satellite era (since 1966) and especially prior to aircraft reconnaissance (since 1944). Matthew has weakened from a category 3 hurricane yesterday afternoon down to a category 1 hurricane overnight. Matthew has officially made landfall near Mcclellanville, SC as a category 1 hurricane. Matthew has weakened due to a shallower continental shelf and lower ocean heat content. Also as Matthew has tracked further north it has been able to wrap in some cooler, drier air into the center of its circulation allowing some weakening. Over the next day Matthew will continue to weaken as it moves along the South Carolina coastline before it moves out into the Atlantic near Wilmington, NC where it will start to track southeastward. The biggest impacts over the next 24 hours will be inland flooding as the rain shield from Matthew extends across the Carolinas and into the southern Mid-Atlantic states as the warm moist air from Matthew rides up and over a frontal boundary across the eastern United States. Just one year after hurricane Joaquin, enhanced rainfall parts of the Carolina’s could see 5 – 14 inches of rain again. Percent of homes that have flood policy thru National Flood Insurance Program (NFIP). Very low take-up rate inland. Storm surge has been the biggest impact overnight. Savannah, GA has seen record flooding breaking the previous record which was created during hurricane David in 1979. Other hard hit areas by high storm surge were Tybee Island, GA, Hilton Head Island, SC and Charleston, SC. However, it would appear the overall height of storm surge was 2 feet below what was forecasted for many of these areas. It has been a long time since a hurricane of this strength has impacted the Georgia, South Carolina coastline. In fact a few years ago I took a trip to Hilton Head Island, SC and I could not believe the over growth of foliage on the island, which was likely due to the fact this area has not recently been hit by a hurricane. Hurricanes are nature’s way of cleaning out some of that foliage. I expect this could lead to some higher than normal insured loss from tree fall right along the coastline. The maximum wind gust record at Hilton Head, SC was 87 mph and Tybee Island, GA was 96 mph. BMS iVision shows the historical 3 sec Max Wind Gust and now the forecasted wind gust. This allows clients to get a complete picture of possible wind damage. Later next week Matthew will be a tropical storm or depression off the southeastern U.S. It would now appear that Matthew’s energy will reach the Bahamas and even track south into the southern Gulf of Mexico later next week, however, not as a named system. Hurricane Ivan in 2004 made a similar large loop and reformed in the Gulf of Mexico. No models at this time forecast Matthew reforming in the southern Gulf of Mexico, but this is something to watch out for. In the next three weeks this would be the area to watch for new tropical development. There is still a chance that Matthew will get caught up with hurricane Nicole in the Atlantic and move out into the open ocean later next week as well. ECMWF ensemble forecast showing many of the 51 members tracking the remnants of Matthew south of the Florida keys next week. 4,001days: that is how long it has been since a major hurricane (Wilma) made landfall in south Florida. And today, Matthew, the violent end to the U.S major hurricane drought, rages into day two. Many of the hurricane models that forecasted a central Florida landfall were clearly wrong, as Matthew is currently 35 miles off the coast of Cape Canaveral as a 120-mph category 3 hurricane. Even the trusted ECMWF model predicted a central Florida impact yesterday. But there are some model winners. The BMS iVision Verisk Climate wind model never predicted a landfalling outcome. And yet again, we see that there is continued room for improving hurricane track and intensity forecasting. As I suggested on October 5, hurricane track will drive outcomes. I also mentioned that the storm size would make a difference, and Matthew’s hurricane force winds never really expanded. Matthew is now expected to parallel the Florida coastline and slowly weaken, so insured loss should be confined to near-coastal areas close to its current location and up to the southern North Carolina coastline. Matthew is forecasted to stall or loop near the southeast coast of the U.S.
“Landfall” is defined as the center of low pressure that intersects with the coast. This has not occurred with Matthew. For several days, weather models suggested that Matthew’s ultimate landfall (or lack thereof) would be determined by just a matter of miles. What might be more interesting than whether or not Matthew makes landfall is the fact that the last two largest U.S. insured losses from a hurricane will ultimately be caused by storms that failed to make landfall. Sandy (2012) was never officially classified as a hurricane and thus didn’t make landfall. Matthew may never make landfall, but will still likely cause significant insured loss; most likely the highest insured loss since Sandy. Matthew never grew in size as expected, and for the most part, always maintained a very small area of hurricane force winds. This area grew only nominally as it moved north as illustrated in the NHC wind history plot below. Matthew has maintained its track parallel to the Florida coastline overnight, as it never got pulled landward, and the hurricane-force wind around its small center of circulation have primarily stayed off shore. This will likely mean that insured losses will be limited, so in some cases insurers will ultimately retain a greater portion of their losses (versus collecting on higher attaching reinsurance programs designed to respond to major natural catastrophes). These retentions could add up, especially since it has been 35 days since hurricane Hermine impacted the state and caused minimal insured loss primarily retained by insurers. Still, the full extent of insured losses will continue to develop as Matthew continues to track up the north-Florida, Georgia, and South Carolina coast. I have yet to identify a hurricane-force wind speed recorded at an official weather station. The highest wind gust I have seen so far is 74 mph, recorded at Vero Beach, Florida. This would not translate into a hurricane-force wind, which must be measured at 1 minute resolution. There have been other reports of high wind, especially on the high tower near the Cape Canaveral coastline. Keep in mind, however, that many of these towers are hundreds of feet tall, and much higher than the official 30-foot measuring height. Other higher windspeed gusts could occur yet today as Matthew tracks very close to the Florida coastline. Although structures will likely sustain damage given the observed wind speeds, ultimate damage should be minimal. To illustrate, see the damage plot below for a pre-2002 home that experienced category2 wind speeds. The outcome shows 35% probability of at least roof sheathing damage. Probability drops to a 5% for a category 1, and even less for a tropical storm force wind. As one would expect, and as my blog previously suggested, flooding can be expected in Georgia and the Carolinas as Matthew tracks northward. Storm surge has not been as bad as forecasted. Areas with 9-foot surge forecasts ultimately experienced only 6-foot surges. However, high storm surge values are still forecasted for coastal Georgia and South Carolina as Matthew works it way northward. Currently some of the highest surge forecast values are found along the North Georgia. Water value observed near Trident Pier, FL showing the build up storm surge at this station in this area and the fall of that water as the storm passed and the water gets pulled away from the shoreline. The burning questions seem to be, “Is Matthew really going to do a loop off the southeast coastline? Is this possible?” Yes, it is very possible, but also unusual. Gordan (1994), Felix (1995), Ivan (2004) and Jeanne (2004) are all examples of looping storms. However, as indicated in the plot below, south or even southeast hurricane movement is rare, as most trajectories for Atlantic hurricanes track northeast. Another burning question is, “Will Matthew loop back and impact the Bahamas and Florida again?” It is possible and still a possible outcome on many of the long-range ensemble forecasts. My bet is that Matthew will loop northeast of the Bahamas, but then be kicked back out to sea toward Bermuda around Thursday next week. Matthew is a weak category-4 hurricane and will likely slowly strengthen today as passes over Nassau, Bahamas. Matthew will likely make landfall between Jupiter, Florida, and West Palm Beach, Florida, as a category-4 hurricane. Landfall should weaken Matthew to a category 2 by the time it reaches Daytona Beach, Florida, and then travels up the coastline. I don’t anticipate that the center will track more than 10-20 miles inland. There is a very small chance that Matthew will become a category 5 hurricane before it reaches the Florida coastline, as it will likely strengthen until its inner core starts to interact with the Florida coastline. Estimating the maximum storm surge is a bit complicated as these forecasts depend on Matthew’s track and strength as it travels up the Florida coast. If Matthew weakens due to land interaction, surge will be less severe; but if Matthew stays off shore, more water may move onto the coast, and this surge could be further complicated by multiple tide cycles that are expected during Matthew’s move up the coastline. Given the large amount of exposure along the coast and expected wind gusts of 144 mph, this will no doubt be a significant insured loss event. For specific impacts, each National Weather Service (NWS) office is offering detailed forecasts for Matthew. In the longer-range forecast, Matthew will likely loop over or the stall off the southeast coast this weekend or early next week. This will limit insured losses in locations that are north of South Carolina. As I have mentioned, Matthew is tracking over very warm water in the Bahamas. This warm water will continue to fuel Matthew until it starts to interact with the Florida coastline tomorrow morning. Keep in mind that hurricane-intensity forecasting is typically more predictable than hurricane-track forecasting. Matthew already surprised us this past weekend with rapid intensification to a category-5 hurricane in the southern Caribbean. It should be noted that, currently, no model guidance is forecasting further rapid intensification. The intensity guidance below show most models are in the camp that Matthew will be category 4 hurricane at landfall or along the Florida coastline. With Florida land interaction expected in the 36 hours. The intensity of Matthew should weaken considerable especially if it tracks inland a bit vs staying over open water. For the last week, meteorologists have used the long-range hurricane models to predict Matthew’s track. We are now within what is considered the short-term forecast window where higher-resolution weather models become a bit more useful for providing specific hurricane forecasting. HRRR (High Resolution Rapid Refresh) is a high-resolution (3K grid resolution) model which shows the details of a hurricane and its impacts. This model is updated hourly and forecasts the next 18 hours. Here is the latest hourly forecasts. My general expectation is that Matthew will make landfall and track inland 10-20 miles along interstate highway 95. This counters some high-resolution models that suggest Matthew will track along the Florida coastline. Three of these models are the HWRF, GFDL and Verisk Climate model (which is the basis for BMS iVision). HWRF Forecasted Wind Swath. This is not surface wind speeds These are winds at 900 mb which close to the surface. GFDL Forecasted Wind Swath. This is not surface wind speeds These are winds at 900 mb which close to the surface. BMS iVision Verisk Climate wind swath which is a version of the WRF model. Users of iVision can use this product to get an ideas of risks impacted by wind speed. One important point I want to make is no numerical weather prediction model is at a high enough resolution to resolve the details of surface roughness. It is this surface roughness that would likely weaken the winds inland. So many of the modeled forecast plots above are likely overestimating the wind speed. This is particularly apparent in the National Weather Service forecasted wind swath. At this time, much can be gleaned from the various NWS forecast products because they offer great detail on potential impacts. These details include likely power outages, specific areas that are prone to flooding, tornado threats, etc. Many of these NWS offices offer public video briefings as well. In some cases the wording is quite strong, and for good reason, as Matthew is a dangerous, life-threating storm. Estimating the maximum storm surge is a bit complicated as these forecasts depend on Matthew’s track and strength as it travels up the Florida coast. If Matthew weakens due to land interaction, surge will be less severe; but if Matthew stays off shore, more water may move onto the coast, and this surge could be further complicated by multiple tide cycles that are expected during Matthew’s move up the coastline. Please utilize the new NHC storm surge forecast guidance. This guidance will change with the NHC track forecast. Right now the worse storm surge will occur in north Florida where the continental shelf extends out into the Atlantic and water will have more time to pile up. Surge values in this general area could be greater than 9 feet in isolated locations. Another issue that is not being talked about much is the possible flooding of Lake Okeechobee. The lake level is very high right now at 15.78 feet. A risk of flooding starts to occur if this lake reaches 17″. If the lake level goes up to 20″ this could be a major concern as this is a known dike that is dire need of upgrades and if given to much stress it could break if water levels get too high. Matthew will no doubt raise this lake level. The Weather Channel has a good summary of the risk. As we have seen for over the last week, Matthew’s long-range forecast remains uncertain. But the chance of significant insured loss at locations north of South Carolina is declining. Many global models suggest Matthew will loop off the southeast coast. Some of these model solutions even take Matthew back into the Bahamas or Florida, and in one extreme case, back into the Gulf of Mexico. Most likely, Matthew will sit and stall near the southeast coast and weaken while doing so. Matthew will eventually be kicked out into the Atlantic Ocean. However, as with any long-range hurricane track forecast, a lot of variables are at play, so Matthew’s long-range tracking still requires watching. Matthew has weakened slightly due to interaction from Cuba and Haiti yesterday and is currently still a weaker Category 3 hurricane 115 miles south of Long Island Bahamas. However, it will only take 12 – 24 hours to regain strength into a stronger category 3 or 4 hurricane as it nears the Florida coastline. Wouldn’t it be something if a major hurricane comes within miles of the Florida coastline and the major hurricanes drought lives on? How about the fact than that the last two major hurricanes to impact the U.S. never made landfall? This is still an option as some models keep Matthew from making landfall and other models have it making landfall in Florida. I have no change in the analog storms provided in yesterday’s update as it relates to southeast impacts. When a hurricane is forecast to take a track roughly parallel to a coastline, as Matthew is forecast to do from Florida through South Carolina, its impact can vary greatly depending on this final track. A small deviation of the track to the left of the NHC forecast could bring the core of a major hurricane onshore, while a small deviation to the right could keep all of the hurricane-force winds offshore. Depending on location some parts of the southeast have been fairly wet over the last 30 days. This could amplify the inland flood threat and increase tree fall where the ground could be saturated. As much as 5 to 7 inches of rain is forecasted for coastal areas of the southeast. There is still uncertainty in the long range forecast. As mentioned almost a week ago there is a chance Matthew would do a loop off the southeast coast. More and more model runs are coming around to this idea. This decreases the threat to northeast impacts late this weekend and into next week. However, this increases the chances that the Bahamas or even Florida could see a second landfall from Matthew. Rising issue of hour clauses and what part of the storm caused the loss if this scenario occurs. As expected Matthew has weakened slightly due to interaction from Cuba and Haiti yesterday. However, as stated almost a week ago the water along the forecasted path of Matthew is very warm and should allow for Matthew to strengthen as it moves closer to the Florida Coastline. I was also expecting Matthew to grow in size as currently the hurricane force winds only extend out 40 miles from the center of Mathew. Depending how far off shore Matthew stays will determine the strength of the hurricane north of the Bahamas. If Matthew stays off shore I still see no reason why Matthew would not become larger and stronger than the current NHC forecast. Tropical Cyclone Heat Potential highlighting the water over the Bahamas is near the top of the scale. Lots of energy for hurricane growth. As you might imagine the overall impact of Matthew on the southeast coastline will depend ultimately where it tracks along the coast or if it makes landfall. The NHC sums up the overall uncertainty here in its key messages. To illustrate the point let’s take the current NHC forecast point near West Palm Beach, Florida, and shift an illustrated impact area 10 miles on either side of that point. As you can see the overall track of the storm makes a big difference. There is still a risk of storm surge potentially affecting certain coastal locations. Overall, the Atlantic side of Florida has a steep shelf offshore which tends to protect the coastline from large surge. However, wave action could be a concern given the lack of beach area along the east coast of Florida. As stated yesterday the direction of Matthew to the north will also mitigate the most significant of surge threats but this threat increases in northern Florida and in Georgia and the Carolinas. Again, like wind impacts, the surge impacts are dependent on the size of the storm, the intensity, and the track. With the understanding that it’s been a long while, over 10 years, since a major hurricane impacted Florida and in some cases a major hurricane has never impacted parts of Florida. This means the overall foliage is likely over grown and needs a good cleaning. It is Mother Nature’s job to do this and if it has not been done in a while this can surely increase insured loss. We can also look to see if tree fall has a higher likelihood of occurring due to wet soil conditions. Some parts of the southeast have been fairly wet over the last 30 days. This could amplify the inland flood threat and increase tree fall where the ground could be saturated. As much as 5 to 7 inches of rain is forecasted for coastal areas of the southeast. Rainfall over the last 30 days for the Southeast U.S.
Departure from normal of this rainfall over the last 30 days. In some locations the rain might be a welcome sight as it has been dry. With any hurricane forecast there uncertainty in the long range forecast. As mentioned almost a week ago there is a chance Matthew would do a loop off the southeast coast. More and more model runs are coming around to this idea. This decreases the threat to northeast impacts late this weekend and into next week. It is still too early to have complete confidence in this shift. However if this does occur maybe we will have yet another example of a hurricane that loops. This would also increases the chances that the Bahamas or even Florida could see a second landfall from Matthew. Rising issue of hour clauses and what part of the storm caused the loss if this scenario occurs. A large GIF annimation of 00z GFS 240-hr forecast at full-res 13-km showing surface wind speed. Matthew will cause U.S insured loss based on current analog tracks. Matthew will be a major hurricane as it tracks along the East Coast of Florida up into North Carolina. The NHC still does not see this as a major hurricane impacting North Carolina, but I do if the storm stays off shore. I still also expect Matthew to grow in size to a much larger hurricane than it is now. Matthew still has a chance at making a Florida landfall as surface friction could get pulled in. Matthew will no doubt be a devastating hurricane for Haiti and the Bahamas. It’s been nearly four years since the last Tropical Storm Watch has been issued for south Florida. This has now issued by the National Weather Service hurricane warning and evacuations could soon follow. *The impacts below are for the current NHC forecast track which keeps Matthew off the coast of Florida as it tracks up the east coast of the U.S for the next five days. Here we mostly focus on Florida impacts. The first thing to consider in terms of wind impacts will be to understand that the strongest winds in a hurricane in the northern hemisphere occur on the right side of the storm. On the right side of the hurricane the winds also extend out from the center the furthest. On the left side of a hurricane the winds extend from the center of a hurricane less and the winds can be slightly weaker. Since Matthew is forecasted to track up the East Coast of Florida the weaker side of the hurricane will be impacting the coastline. Clearly the closer Matthew tracks to the coastline the higher the wind impact might be. Also if Matthew grows in size, as I expect it to do, the impacts could be worse. Given the current forecasted track by the NHC generally hurricane force winds would only be experience right at the coastline and tropical storm force winds would extend at most 20 – 40 miles inland. To aid in understanding wind impacts BMS clients have access to Verisk Climates custom hurricane wind field forecast. This is just one forecast of many and is subject to the same errors of other forecast model output, but users can get an understanding of how winds impact their portfolio. Current Verisk Climate Modeled windfield in iVison. This forecast is just one of many forecasted tracks Matthew could take over the next few days. Storm surge will be an issue for the entire coastline as the storm moves along the coast of Florida, but since the storm will parallel the coastline the surge would not be as bad if the storm were impacting the coast in a perpendicular direction. Here is a link the the NHC current storm surge guidance. Of course inland flooding could also be a concern with a large amount or rain falling over a short period of time. Depending on coverage wording Business Insurance (BI) losses could result due to evacuations. The last time a storm tracked up the east coast (Floyd 1999) it caused a massive evacuation of the Florida Coastline. As the storm turned to the north across the Bahamas, a progressively larger area of the Florida coastline was threatened. It is estimated that Floyd was at the time the largest peacetime evacuation ever in the U.S., with around 2.6 million evacuating coastal areas in Florida, Georgia, and the Carolina’s. I have spent a good amount of time going year by year to find a good set of matching analog historical storms that took a similar track to Matthew’s. There is no perfect fit as every storm is different, but the following storm can help insured understand what impacts might occur to their portfolio of risks. Estimated insured losses from historical events is not an exact science, there are known changes to wealth, population, etc, but the normalization of these damages can help compare losses if they all struck land today. This research has been carried out by Pielke Jr. et al 2008 and have been adjusted by BMS to account for insured loss. Floyd in 1999 tracked up the east coast of Florida as a category 3 / 4 hurricane and made landfall in North Carolina as a Category 2. Floyd at the time caused $50m in insured loss to Florida and today would cause an estimated 4.8B in insured loss to other east coast states. David 1979 could also be used as an analog event but the storm tracked very close to the Florida coastline, closer than Matthew is forecasted to. David was also only a category 2 along its path. It is estimated that David would cause 1.6 billion of insured loss to Florida and Georgia in today’s dollars. Clearly a stronger hurricane along its path this close to the coastline would cause higher losses. An older analog that actually made landfall in Florida would be Unnamed Storm 1 1926 (Different then the Great Miami Hurricane of 1926) Today this storm would cause 3 Billion in insured loss today. Hurricane Storm 1 1926 – Track with Florida landfall which is still an option. Could Matthew make U.S Landfall? Currently the NHC official forecast keeps Matthew off shore as a major hurricane with a landfall in the Outer Banks of North Carolina. However, there are still several forecasts that result in a landfall either in Florida, Georgia, or South Carolina and these states are still in the cone of uncertainty. The exact location of a landfall or track won’t be known for another day or two. If Matthew tracks close enough to land frictional effect could pull the storm inland, but given Matthew is forecasted to move at a slower speed this effect is less likely to occur. As we have seen there is a consistent westward shift in model tracks and if this occurs the landfall possibilities will continue to increase. There is a 80% chance the coastline of Florida will experience tropical storm force winds. The chances of Florida experiencing hurricane force wind speeds is 30%. It should also be noted that some model runs still stall Matthew off the North Carolina coastline which add to the forecast complexities in the long term. At this time northeast impacts appear to be limited as Matthew would stay out at sea. Matthew continues to be a powerful category 4 hurricane 275 miles SW of Port Au Prince Haiti. Matthew will be a devastating hurricane for Haiti and the Bahamas. It should not be surprising if Matthew become a category 5 hurricane near Haiti and Cuba. Little weakening should be expected from the higher topography as Matthew tracks between Haiti and Cuba. NHC is still under-forecasting the overall intensity of Matthew north of the Bahamas and I don’t see any reason why it would not be a major hurricane north of the Bahamas. Although Matthew is a small size hurricane at this time, hurricane force winds extend 30 miles from the center and tropical storm force winds extend 195 miles from center. Matthew’s size should grow in extent north of the Bahamas, increasing wind related impacts. Matthew’s forecast model guidance has shifted to the West closer to the U.S. overnight. This increases the probability of U.S landfall. This even increases the threat of a Florida landfall or impacts. But at this time over the next week the highest U.S. landfall probability is North Carolina and the Outer Banks. Still an option on the table is that Matthew could stall off the Southeast coastline and not turn out to sea. There are a lot of options on the table north of the Bahamas as the forecast has a large amount of uncertainty still. Yesterday I pointed out how small Matthew was, but already today the size of hurricane force winds has doubled to over 30 miles from the center of the storm. I expect the size of Matthew to get much larger as it tracks north particularly in the Bahamas and points North. HWRF forecast for Sat Oct 8 showing a much larger windfield as Matthew moves northward. I still feel the NHC is too weak on its intensity forecast North of the Bahamas. Besides wind shear there is nothing preventing Matthew from becoming a major hurricane north of the Bahamas as the waters off the east coast are above normal temperature and can support a stronger hurricane. This also means as the track of Matthew shifts closer to the U.S. expect a higher insured impact even from a bypassing storm. Over the weekend the U.S landfall probability was fairly steady. However, with the northward turn of Matthew and the huge amount of data now flowing into the global weather models from extra weather balloons and aircraft the models might be getting a better handle on the future track of Matthew. In fact, over night the threat has increased for the U.S. and a U.S. landfalling hurricane is not off the table. There is still a probability of this occurring even in Florida. The North Carolina Outer Banks have the highest probability of landfall at this time, but there can be high insured impact even if the storm bypasses the U.S coastline. Remember Floyd in 1999 never made a Florida landfall, but caused 50 million in insured losses at the time. In total as Floyd moved up the U.S coastline it’s insured impacts would be equivalent to a 4.5 billion dollar insured loss today. 1999 Hurricane Floyd track up the East Coast of the U.S. The probability of a U.S landfall has increased from 35% to 45% probability as the overall guidance has shifted to the west toward the U.S. coastline with a 55% likelihood Matthew will staying out to sea beyond the Bahamas. However, as stated since last week, it is a complicated forecast with lots of options on the table. The ridging in the central Atlantic seems to be increasing which is likely going to continue to force Matthew westward a bit. Some models even merge the newly designated Invest 98 which is currently a broad area of low pressure located about 400 miles northeast of the northern Leeward Islands. As I talked about last Thursday, there was a chance Matthew might stall off the southeast coastline, this option is still on the table and last night’s ECMWF model shows this in the red line in the ECMWF ensemble forecast below. ECMWF forecast in red. Shows Matthew stalling out. The NHC official forecast shown in black line. 51 individual ECMWF forecast shown in gray lines many with Florida landfall which cannot be ruled out.